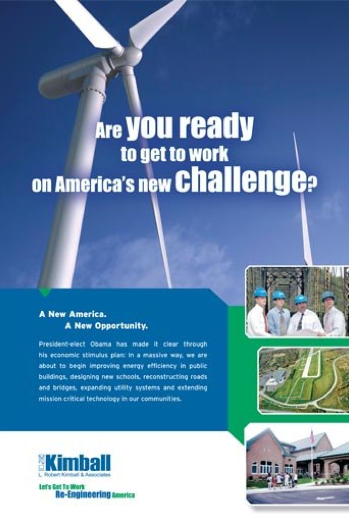 Kimball Engineering, one of the country’s largest engineering firms, was looking for a way to capitalize on the incoming administration’s plans for “Rebuilding America”. They hoped with the emphasis being put on the rebuilding of the national infrastructure in the country, their expertise in government, schools, hospitals and security could grow. A new logo was developed to symbolize these efforts, and this design was used on all their communications, ranging from print, web, posters, and direct mail.